If your doctor referrals are dropping or you are concerned about the future of your practice, we can help you! Gilleard Dental Marketing has an excellent track record marketing periodontists. In today’s competitive market, we help periodontists interest consumers in their expert services in a way that doesn’t need to conflict with their referral base. Our periodontist clients have achieved a good flow of new patients with both our Internet and direct mail products. In the last years the line between the specialist and the general dentist has blurred, making it necessary for many periodontists to augment their traditional referral practice with direct-to-consumer marketing. We have been able to help periodontists successfully make this transition. Key to this success has been websites and magazines that properly show the expertise and value of our clients’ periodontal and implant work. Gilleard Marketing can help you achieve your marketing goals. Call 855‑486‑2410 or click here to schedule your free consultation and find out how. Four times as many patients the first month I was with Gilleard. “I’ve been marketing as a periodontist for a number of years and as you know, as a periodontist, we have a shrinking market that we’re marketing to when we’re working with general dentists. That doesn’t mean we take general dentists out of the equation, but frankly there are a number of things we can do and we do them very well and of course one of them is dental implants. 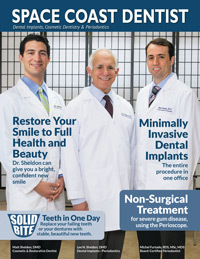 “Marketing is increasingly important for the periodontist. Patients need to know how to find us as the source for treatment planning of complex dental cases. And that’s what Gilleard Dental Marketing has done, brought patients to our office that need complex care. “When I went to Gilleard I had a lot of experience in marketing myself: I’d had a website and had done different campaigns to bring patients in. When I went with Gilleard, I found that they were able to increase the number of patients that I got. Four times as many patients the first month I was with Gilleard. “We started with the website and accompanying Google AdWords campaign. Such brings us 20-25 new patients every single month. We then added the sixteen-page magazine to provide additional marketing punch. The magazine is a great public relations as well as marketing piece. We are getting an additional 25-30 new patients from that magazine. “Periodontists, let’s remember who we are. We are diagnosticians first. We develop predictable treatment plans and work with restorative dentists as well as other specialists to produce long-lasting smiles and function. If you have the mindset that you want to see more patients who need and want the services that we provide, Gilleard can and will provide those patients to you. Dr. Lee Sheldon is the founder of the AAIP, the American Association of Independent Periodontists, an association to assist in helping the periodontists experiencing drops in their referrals. Read Dr. Sheldon’s letter to periodontists here. “Gilleard Dental Marketing is the best! All their employees are very professional and provide many different services from the creative directors, distribution personnel, internet marketing and much more. Gilleard Dental Marketing has launched our practice from 14-15 patients a month to 50+ a month and going up.